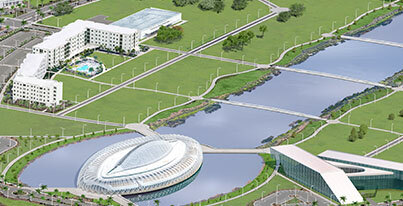 Florida Polytechnic University’s most recent Google+ Hangout explored ways future generations can reduce the world’s consumption of natural resources by adopting green technologies. Leading the discussion “The Sustainability Gap: What is Means for Future Generations” was Assistant Professor of Chemistry Jaspreet Singh Dhau; Assistant Professor of Electrical Engineering, Ryan Integlia; Assistant Professor of Physics, Sesha Srinivasan; and Undergraduate Research Student, Mark Glaser. What is the sustainability gap? How will harvesting energy help future generations? How will Florida Poly’s sustainable garden use technology to grow plants and vegetables? What coursework from Florida Poly will focus on creating a more sustainable future? Why is the topic of renewable energy considered controversial? Anyone who missed this Google+ Hangout can view the entire recorded version on Florida Poly’s Youtube Channel. Stay tuned for additional STEMTalks!